MK note: Here I am (as fuzzy as usual) with Rhee Tong Kuhn and Pak Jin Ho. I am the Korean looking guy in the middle. 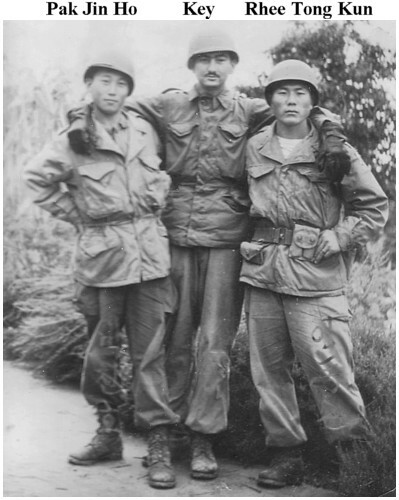 While we three (all being members of the same squad) were in a reserve area, the two of them escorted me into a Korean village where we all, as guests, ate free Kimchi and had this picture taken. They were good, loyal soldiers who took good care of me at all times. MK.